Doors were 24 meters high. 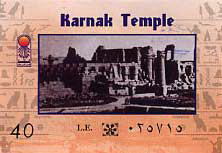 Karnak=village name=was person's name. Thebes=Greek name; impressed so named after the Greeks. 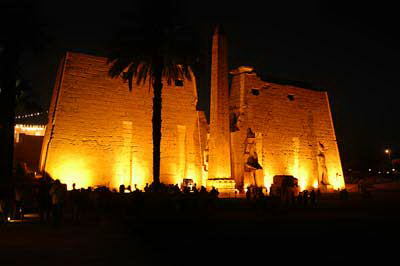 Luxor is Arab name. 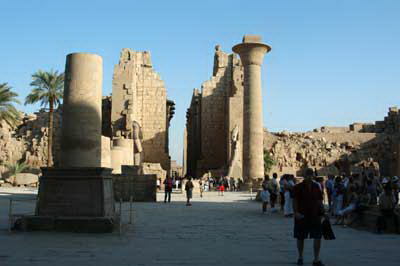 Arabs though they were seeing palaces so named place Luxor which means palace in Arabic. King visits as a god, not as the king. 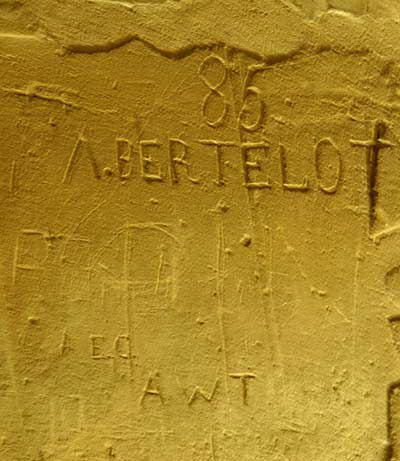 Dedicated to the triad of Thebes: Amun, Mut & Krantz (?) (father, mother, son). Destroyed 4X by kings; each new king wanted it empty to bring his own statues & columns. "Vatican" of ancient Egypt. Each king wanted to be considered son of Amun Ra. Took 1400 years to finish. Ammenhotep started it. In Ancient Egypt, you were the king if your mother was the queen. All her sons took turns. A woman could be concubine but her kids were not royals. Pyramids were covered w/gold & silver. (Hatshepsut). 335 Alexander the Great died. 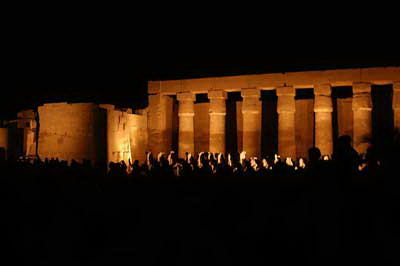 Power went to Ptolemy. The last Ptolemy was Cleopatra which ended by Antony. 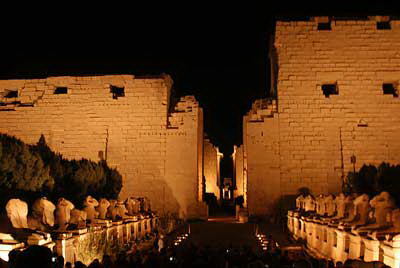 1200 BC Seti built 1-2 rows of columns but he died before their completion. 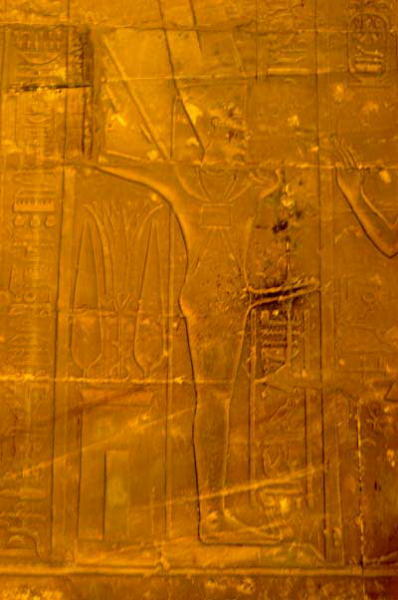 His son Ramses II took over and added up to 134. The top floor was the library; slits are for light. The pillar was by Hatshepsut; one piece of granite. The other pillar was her husband's but not as nice. She had a dream where she promised a pillar of gold but when woke up too much to give so changed it to granite. Biggest temple in the world. Entry to the Temple of Karnak. Built over a few millenia, adding on by each Pharaoh. 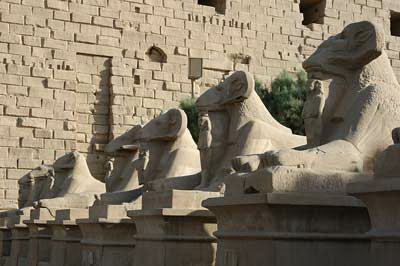 Line of sphinxes with ram's heads. 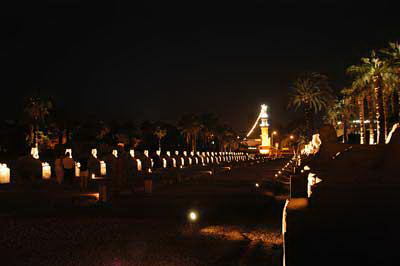 Luxor is full of rows of sphinxes. 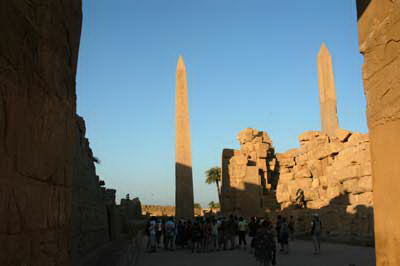 Obelisks in Karnak. One was built by the only female Pharaoh, Hatshepsut. Aki took us to this obscure small temple on the Karnak grounds where a darkened chamber was home to a god of evil, whose name I do not know. Certianly looked evil. 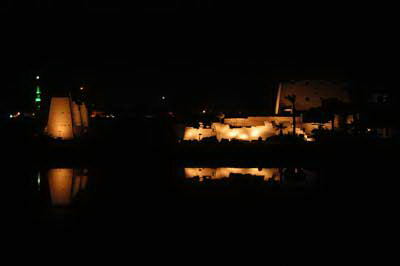 It was almost dark when we got to the Luxor Temple, so we got a beautiful view. Looking the other direction, you can see a road lined with sphinxes and a mosque in the distance. This road ran about 3 km with sphinxes all the way, it seems. 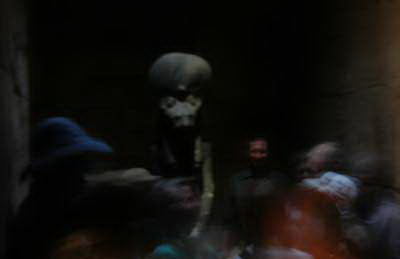 The god of fertility. No kidding. And what do people rub for good luck? Wonder who started that rumor? Karen and I went back to Karnack for the evening light and sound show, and it was beautiful. Two more photos below.